The P2LX Deluxe Signature Series is popular for those who want exact power control with the Trim feature. It offers power settings from 200ws, 100ws and 50ws like the older Classic Packs but also has lower power settings at 25ws, 12ws, 6ws and 3ws. Once you select the main setting then you can Trim down that setting to exactly where you want it between the f-stops. These lower power settings are very valuable when you wish to shoot at higher ISO settings and get lower f-stops for limited depth of field. The control between settings can be important if you don't want to move the head closer or further to get the exact exposure that you want. Power on/off and all seven main power settings are easily selected with a single rotating dial in the center of the Pack. The Trim control is also on top and is a smaller rotating knob. 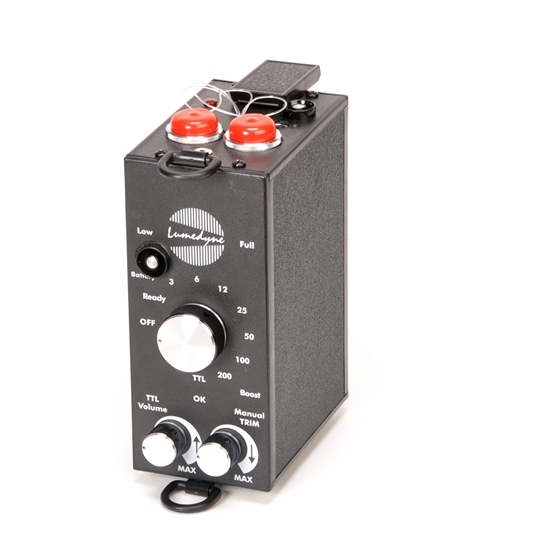 The third knob is a TTL volume control for a confirmation tone only used for TTL and only active when TTL signals from a Metz™ brand TTL module is used to trigger the Deluxe Signature Series Flash Heads. If TTL is not desired, any model Lumedyne Head is OK. The battery gauge is simple and has an on/off switch while the pack is running. There is a separate switch to select between fast or extra fast recycling times. Faster recycling does get less flashes per charge from each Battery charge. The Signature Series can use the classic NiCd batteries, the newer NiMh cells or the LiFePo4 Lithium options but the battery gauge will be the most accurate for the first two since the LiFePo4 Batteries have their own accurate gauge on the Battery. You can run one or two Flash Heads from the front of the Pack and if two Heads are used, they simply divide the available setting in half for each Head. By using Deluxe Boosters, you could have asymmetrical power output options too. The Signature Packs can power all the Heads including Classic Heads and the new versions but the Ringflash Head will be less linear at the lowest power settings. Only the Deluxe Signature Series Head will enable TTL features in your Deluxe Pack (along with the correct Metz™ TTL SCA Module) and also offers an audible beep tone after recycling to let you know that the Head is ready again. The Signature Series Packs include a neoprene shoulder strap and a full two-year warranty. The other accessories or Heads (and Head Cables), Batteries and Chargers are sold separately.